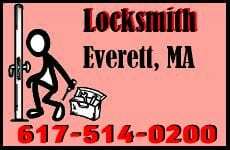 Bursky Locksmith in Everett MA offers topnotch service 24 hours a day, 7 days a week. We have the best technicians in the state and can accomplish any type of locksmith job you need at anytime of the day or night. For any type of lock repaired, replaced or opened, any type of key or keyless device made and delivered to you, give us a call; we guarantee you won’t be disappointed with our work. No matter what time it is, where in the area you happen to be at that time, or whatever type of locksmith service you need, we will deliver outstanding maintenance right to you. Our staff consists of the most skilled technicians in the Bay State, and we guarantee that you will be pleased with whatever work we do for you, as well as with the time frame in which the work is done. High quality work and customer satisfaction are among the chief concerns of Bursky Locksmith Everett MA. Whatever your safety concerns are, you can depend on us to resolve your security issues. The employees of Bursky Boston Locksmith Everett MA are the most reliable professionals in their field of expertise, which includes finding and implementing the best possible measures that are needed to protect you and your property. Using their extensive training, experience and skills, they can provide whatever security system is need to fully protect your home, business, or vehicle. Are you locked out the car on the morning of a big job interview? Did your warehouse just receive a shipment of priceless artifacts that need extra protection? Or maybe you’re assisting a stage performer and happened to lose the key you were supposed to slip him before he strung himself with padlocked chains and sunk to the bottom of a giant water tank? Whatever the case may be, call Bursky Locksmith in Everett MA. We can handle any emergency involving a lock or key, and will immediately send you an expert to resolve your problem as quickly as possible. Bursky Locksmith can send you the answer to all your lock and key problems. Call to receive a fast and reliable locksmith at anytime of the day or night.